Malcolm Gladwell critique: David and Goliath misrepresents the science. I thought he was sincerely misunderstanding the science, but he knows exactly what he is doing. 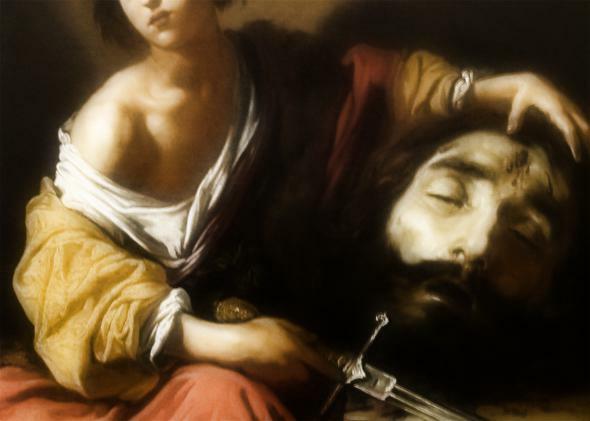 David with the head of Goliath, by Claude Vignon, 1620-23, Blanton Museum of Art, Austin. Malcolm Gladwell, the New Yorker writer and perennial best-selling author, has a new book out. It’s called David and Goliath: Misfits, Underdogs, and the Art of Battling Giants. I reviewed it on Sept. 28 in The Wall Street Journal. (Other reviews have appeared in the Atlantic, the New York Times, the Guardian, the Financial Times, the Millions, and Slate, to name a few; the Guardian has even “digested” the book into a 600-word satire.) The WSJ editors kindly gave me about 2,500 words to go into depth about the book, but there were many things I could not discuss or elaborate on. So here are some additional thoughts about Malcolm Gladwell, David and Goliath, the general modus operandi of his writing, and how he and others conceive of what he is doing. I enjoy Gladwell’s writing and am able to take it with the proper portion of salt … I read (and write about) most pop science as science fiction: good for thinking about things in novel ways but not so great for basing your cancer treatment on. [C]ritics have primarily focused on whether the argument they think Gladwell is making is valid. I am going to argue that this approach misses the fact that the stories Gladwell tells are simply well worth reading. I say good for you to everyone who doesn’t take Gladwell seriously. But here’s why I take him seriously: because I take him and his publisher at their word. On their face, many of the assertions and conclusions in Gladwell’s books are clearly meant to describe lawful regularities about the way human mental life and the human social world work. And this has always been the case with his writing. In The Tipping Point, Gladwell wrote of sociological regularities and even coined entirely new ones, like “The Law of the Few.” Calling patterns of behavior “laws” is a basic way of signaling that they are robust empirical regularities. Laws of human behavior aren’t as mathematically precise as laws of physics, but asserting one is about the strongest claim that can be made in social science. To say something is a law is to say that it applies with (near) universality and can be used to predict, in advance, with a fair degree of certainty, what will happen in a situation. It says this is truth you can believe in, and act on to your benefit. “The three rules of the Tipping Point—the Law of the Few, the Stickiness Factor, the Power of Context … provide us with direction for how to go about reaching a Tipping Point,” Gladwell writes (emphasis mine). The emphasis on changes is in the original (at least in the version of the quote I saw on Gladwell’s Facebook page). In an excerpt published in the Guardian, he wrote, “If you take away the gift of reading, you create the gift of listening.” I added the emphasis on “create” to highlight the fact that Gladwell is here claiming a causal rule about the mind and brain, namely that having dyslexia causes one to become a better listener (something he says made superlawyer David Boies so successful). There is this tremendous body of knowledge in the world of academia where extraordinary numbers of incredibly thoughtful people have taken the time to examine on a really profound level the way we live our lives and who we are and where we’ve been. That brilliant learning sometimes gets trapped in academia and never sees the light of day. I’m trying to give people access to all of that brilliant thinking. It’s a way of going back to college long after you’ve graduated. To me, all this suggests that Gladwell thinks he is conveying scientific knowledge to the masses, and wants to be judged on whether he has succeeded. He has certainly reached the masses—he was on the cover of the Costco Connection!—and I don’t begrudge him this at all. The question then is whether he is accurately conveying the science. Not whether he is making little mistakes or leaving out details that would bore the nonspecialist, but whether he is getting the big ideas right. I’ve gone on at length with these examples because I think they also run counter to another claim that is sometimes made about Gladwell’s writings: That he does nothing more than restate the obvious or banal. I couldn’t disagree more here. Indeed, to his credit, what he writes about is the opposite of trivial. If Gladwell is right in his claims, we have all been acting unethically by watching professional football, and the sport will go the way of dogfighting, or at best boxing. If he is right about basketball, thousands of teams have been employing bad strategies for no good reason. If he is right about dyslexia, the world would literally be a worse place if everyone were able to learn how to read with ease, because we would lose the geniuses that dyslexia (and other “desirable difficulties”) create. If he was right about how beliefs and desires spread through social networks in The Tipping Point, consumer marketing would have changed greatly in the years since. Actually, it did: Firms spent great effort trying to find “connectors” and “mavens” and to buy the influence of the biggest influencers, even though there was never causal evidence that this would work. (Read Duncan Watts’s brilliant book Everything Is Obvious, Once You Know the Answer—reviewed by me here—to understand why.) If Gladwell was right, also in The Tipping Point, about how much news anchors can influence our votes by deploying their smiles for and against their preferred candidates, then democracy as we know it is a charade (and not for the reasons usually given, but for the completely unsupported reason that subliminal persuaders can create any electoral results they want). And so on. These ideas are far from obvious, self-evident, or trivial. They do have the property of triggering a pleasurable rush of counterintuition, engaging a hindsight bias, and seeming correct once you have learned about them. But an idea that people feel like they already knew is much different from an idea people really did know all along. The world becomes less complicated with a Malcolm Gladwell book in hand. Mr. Gladwell raises questions — should David have won his fight with Goliath? — that are reassuringly clear even before they are answered. His answers are just tricky enough to suggest that the reader has learned something, regardless of whether that’s true. I don’t think the main flaw is oversimplification (though that is a problem: Einstein was right when he—supposedly—advised that things be made as simple as possible, but no simpler). As I wrote in my own review, the main flaw is a lack of logic and proper evidence in the argumentation. But consider what Gladwell’s quote means. He is saying that if you understand his topics well enough to see what is erroneous or missing, then you are not the reader he wants. At a stroke he has said that anyone equipped to critically review his work should not be reading it. How convenient! Those who are left are only those who do not think the material is oversimplified. Who are those people? They are the readers who will take Gladwell’s laws, rules, and causal theories seriously; they will tweet them to the world, preach them to their underlings and colleagues, write them up in their own books and articles (David Brooks relied on Gladwell’s claims more than once in his last book), and let them infiltrate their own decision-making processes. These are the people who will learn to trust their guts (Blink), search out and lavish attention and money on fictitious “influencers” (The Tipping Point), celebrate neurological problems rather than treat them (David and Goliath), and fail to pay attention to talent and potential because they think personal triumph results just from luck and hard work (Outliers). It doesn’t matter if these are misreadings or imprecise readings of what Gladwell is saying in these books—they are common readings, and I think they are more common among exactly those readers Gladwell says are his audience. These readers are not unintelligent or uncritical; like everyone they are simply people who are not experts in every topic and trust writers to teach them about subjects they don’t know. Note, incidentally, that he mentions coherence, consistency, and neatness. But not correctness, or proper evidence. Perhaps he thinks that these are highfalutin cares for writers and critics, or perhaps he is some kind of postmodernist for whom they don’t even exist in any cognizable form. In any case, I cannot agree with Gladwell’s implication that accuracy and logic are incompatible with entertainment. If anyone could make accurate and logical discussion of science entertaining, it is Malcolm Gladwell. Perhaps … perhaps I am the one who is naive, but I was honestly very surprised by these recent quotes. I had thought Gladwell was inadvertently misunderstanding the science he was writing about and making sincere mistakes in the service of coming up with ever more “Gladwellian” insights to serve his audience. But according to his own account, he knows exactly what he is doing, and not only that, he thinks it is the right thing to do. Is there no sense of ethics that requires more fidelity to truth, especially when your audience is so vast—and, by your own suggestion, so benighted—as to require oversimplification and to be unmoved by consistency and coherence? I think a higher ethic of communication should apply here, not a lower standard. This brings me back to the question of why Gladwell matters so much. Why am I, an academic who is supposed to be keeping his head down and toiling away on inaccessible stuff for others to bring to light for the masses, spending so much time on reading Gladwell’s interviews, reviewing his book, and writing about him? I think that what Malcom Gladwell says matters because, whether academics like it or not, he is incredibly influential. As Gladwell himself might put it: “We tend to think that people who write popular books don’t have much influence. But we are wrong; their influence may be perverse and often baffling, but it is influence nonetheless.” Sure, Gladwell has huge sales figures and is said to command big speaking fees, and his TED talks are among the most watched. But James Patterson has huge sales too, and he isn’t driving public opinion or belief. I know Gladwell has influence for multiple reasons. One is that even highly-educated people in leadership positions in academia—a field where I have experience—are sometimes more familiar with and more likely to cite Gladwell’s writings than those of the top scholars in their own fields, even when those top scholars have put their ideas into trade-book form like Gladwell does. Gladwell proves that not only do many successful people have dyslexia, but that they have become successful in large part because of having to deal with their difficulty. Those diagnosed with dyslexia are forced to explore other activities and learn new skills that they may have otherwise pursued. Of course this is nonsense—there is no “proof” of anything in this book, much less a proof that dyslexia causes success. I wonder if the author of this article even has an idea what proper evidence in support of these assertions would be, or if he knows that these kinds of assertions cannot be “proved.” In any case, we can expect David and Goliath to be cited as evidence—sometimes definitive evidence—many more times. People take Gladwell seriously. So the total influence ratio as measured by this crude technique is 24,500/634, or more than 38-to-1 in favor of Gladwell. I wasn’t expecting it to be nearly this high myself. (Interestingly, those “influenced” by Pinker are only 9/634, or 1.4 percent likely to think he “proved” something as opposed to the arguably more correct “showed” it. Gladwell’s influencees are 5,300/24,500 or 21.6 percent likely to think their influencer “proved” something.) Refining the searches, adding “according to Gladwell” versus “according to Pinker,” and so on will change the numbers, but I doubt those corrections would significantly redress a 38-to-1 difference. And if you are worried that I have rigged the results by trying a lot of comparisons until I found this one, I give you my word that Steven Pinker was the first and only one I tried. And I fully understand that properly tracing and comparing influence would require much more work than this. As I said, it is just one suggestive data point—a story, if you will. (“Did you know that Malcolm Gladwell is 38 times more influential than Steven Pinker? I read it on Slate!”) And I am foregrounding this story’s evidentiary limitations, rather than ignoring them. When someone with the reach and persuasive power of Malcolm Gladwell says that he is a storyteller who just uses research to “augment” the stories—who places the stories in the lead and the science in a supporting role, rather than the other way around—he’s essentially placing his work in the category of inspirational books like The Secret. As Daniel Simons and I noted in a New York Times essay, such books tend to sprinkle in references and allusions to science as a rhetorical strategy. The titular “secret” of The Secret is in fact a purported scientific law—the “Law of Attraction.” Accessorizing your otherwise inconsistent or incoherent story-based argument with pieces of science is a profitable rhetorical strategy because references to science are crucial touchpoints that help readers maintain their default instinct to believe what they are being told. They help because when readers see “science” they can suppress any skepticism that might be bubbling up in response to the inconsistencies and contradictions. I believe that most of Gladwell’s readers think he is telling stories to bring alive what science has discovered, rather than using science to attach a false authority to the ideas he has distilled from the stories he chooses to tell. In his Telegraph interview, Gladwell again played down the seriousness of his work: “The mistake is to think these books are ends in themselves. My books are gateway drugs—they lead you to the hard stuff.” And David and Goliath does cite scholarly works, books and journal articles, and journalism, in its footnotes and endnotes. But I wonder how many readers will follow those links, as compared to the number who will take its categorical claims at face value. And of those that do follow the links, how many will realize that many of the most important links are missing? This leads to my last topic, the psychology experiment Gladwell deploys in David and Goliath to explain what he means by “desirable difficulties.” The difficulties he talks about are serious challenges, like dyslexia or the death of a parent during one’s childhood. But the experiment is a 40-person study on Princeton students who solved three mathematical reasoning problems presented in either a normal typeface or a difficult-to-read typeface. Counterintuitively, the group that read in a difficult typeface scored higher on the reasoning problems than the group that read in a normal typeface. In my review, I criticized Gladwell for describing this experiment at length without also mentioning that a replication attempt with a much larger and more representative sample of subjects did not find an advantage for difficult typefaces. One of the original study’s authors wrote to me to argue that his effect is robust when the test questions are at an appropriate level of difficulty for the participants in the experiment, and that his effect has in fact been replicated “conceptually” by other researchers. However, I cannot find any successful direct replications—repetitions of the experiment that use the same methods and get the same results—and direct replication is the evidence that I believe is most relevant. This may be an interesting controversy for cognitive psychologists, but it’s not the point here. The point is that Gladwell makes absolutely no mention of any uncertainty over whether this effect is reliable. All he does is cite the original 2007 study of 40 subjects and rest his case. As I mentioned in my review, in 2013 this is virtual malpractice for a sophisticated writer whose beat includes social science, where the validity of even highly cited results has come into question. Readers who have been hooked by Gladwell’s prose and look to the endnotes of this chapter for a new fix will find no sources for the “hard stuff”—e.g., the true state of the science of “desirable difficulty”—that he claims to be promoting. And if the hard stuff has value, why does Gladwell not wade into it more deeply and let it inform his writing? He doesn’t need to make his whole book about the troubles with replication and false positive results in social science (though I’m sure he could write a more interesting book on this topic than almost anyone else could). But why not, when addressing the question of how to pick the right college, discuss the intriguing research that considers whether going to an elite school really adds economic value (over going to a lesser-ranked school) for those people who get admitted to both? Or, when discussing dyslexia, instead of claiming it might be a gift to those who have it and is certainly a gift to society, how about considering seriously the hypothesis that this kind of early life difficulty jars the course of development, adding uncertainty (increasing the chances of both success and failure, though probably not in equal proportions) rather than directionality. There is so much more that Gladwell could have done with the fascinating and important topics in David and Goliath and his other books. At least the difficulty finding a simple experiment to serve as illustration might have jarred Gladwell into realizing that there is no relevant nexus between the typeface effect, however fragile or robust it might turn out to be, and the effect of a neurological condition or the death of a parent. Pretending the connection is any more than metaphorical just loosens the threads of logic to the point of unraveling completely. But perhaps Gladwell already knows this. After all, in his Telegraph interview, he said readers don’t care about consistency and coherence, only critics and writers do. I can certainly think of one gifted writer with a huge audience who doesn’t seem to care that much. I think the result is the propagation of a lot of wrong beliefs among a vast audience of influential people. And that’s unfortunate.